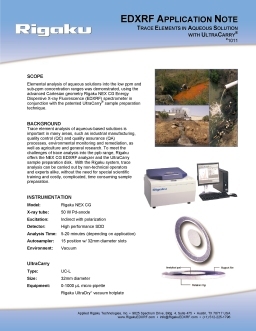 EDXRF | XRF for Environment & Pollution - Applied Rigaku Technologies, Inc.
For characterization and remediation of contaminated soils, sediments, and sludges, EDXRF (XRF) analysis provides quick and reliable assays. 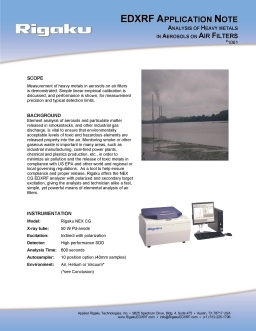 Energy Dispersive X-ray Fluorescence is a standard technique recognized by the U.S. EPA and is routinely employed to determine heavy metal concentrations (RCRA metals) in soils and sediments. The Rigaku NEX CG EDXRF is powered by a new qualitative and quantitative analytical software, RPF-SQX, that allows semi-quantitative analysis of almost all sample types without standards - and rigorous quantitative analysis with standards. The software can automatically estimate the concentration of unobserved low atomic number elements (H to F) and provide appropriate corrections. RPF-SQX greatly reduces the number of required standards, for a given level of calibration fit, as compared to conventional XRF analytical software. With the patented Rigaku UltraCarry, you can use your Rigaku NEX CG EDXRF spectrometer to quantify trace elements in aqueous liquids down to parts-per-billion (ppb) concentration levels. Routine elemental analysis of contaminated water, or industrial wastewater, can now be performed without the web labs associated with Atomic Absorption (AA) or Inductively Coupled Plasma (ICP) instruments. UltraCarry based trace element analysis is suitable for use by non-technical personnel.